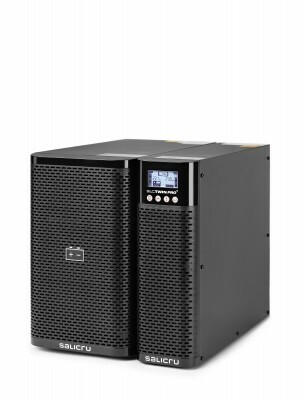 SALICRUâ€™s SLC TWIN PRO2 series is a UPS range in a tower format equipped with on-line double-conversion technology and the latest features to make it an advanced protection system for sensitive and critical loads. High output power factor (PF=0.9) to ensure availability to all types of loads. Full control through status information via LCD display and keypad. And extensive monitoring and communication options via the built-in USB HID interface, an intelligent slot for SNMP cards or relays and a wide range of software packages available â€“ free monitoring version downloadable for Windows, Linux, Unix or Mac and packages available for multi servers or virtualised systems. For facilities that require more back-up time, there is a possibility of backup extensions using UPSs with extra charger and additional battery modules. Also notable is the possibility of Eco-mode operation to improve the efficiency of the device, EPO (emergency power off) functions, operation as a frequency converter and built-in battery test. SALICRUâ€™s SLC TWIN PRO2 range is available in power ratings of 700, 1000, 1500, 2000 and 3000 VA.
Power supply failures in IT systems can cause losses as a result of downtime and the time taken to restore the system to normal operation, and damage to network hardware. Many other disturbances (micro power outages, voltage fluctuations, frequency variations, harmonics, transients, etc.) can also cause IT environments to malfunction.